YouTube is exploding. The company has reported 60 percent year-over-year growth. It’s no wonder people want to be found on YouTube — it’s the second biggest search engine in the world, even if it is just for videos! 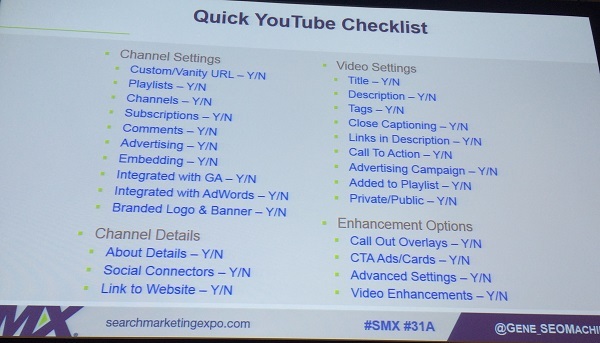 This SEO-track session at SMX East focuses just on YouTube optimization, to show businesses how to take advantage of this huge and largely untapped market. We include lots of slides so you won’t miss any wisdom from these experts that could help you master video marketing. YouTube is a wonderland where new brands are born every day. Why be on YouTube? YouTube is an untapped market for small businesses. The top 100 YouTubers make $100 million a year on YouTube. How can you be found in the YouTube wonderland? Video title – Give your video a good name. Like any other page on the web, include up to 70 characters with a call to action (CTA). Use “official,” “new” or similar words to bring more attention to videos — DIY, Tips, Video, How-To, For More Info Call, Testimonials, Case Study, Tutorial, Reviews, Free, 60 second video. Video description – Tell me more. Include 300 words or more with sprinkled keywords. Summarize the content, emphasize important comments or “quotes” from the video, link to pages and resources in the video using absolute URLs. The more detail you put in your video description, the better. Video tags – Tags communicate that “this video is relevant to __”. Be generous (up to 20 tags is okay). Suggestions: brand name, position/title, competitor’s name. Closed captioning – It’s more than 508 (compliance). If you’re not doing captioning, then don’t bother to do YouTube (more reasons you need to closed caption your videos: http://youtube.com/watch?v=WmTMiWGiP6Y). Backlink to videos – Yes, backlinks. Use relevant anchor text. Allow video embedding, if possible. Expand referring sources (share). Link to video from Facebook, LinkedIn, Twitter and blogs. 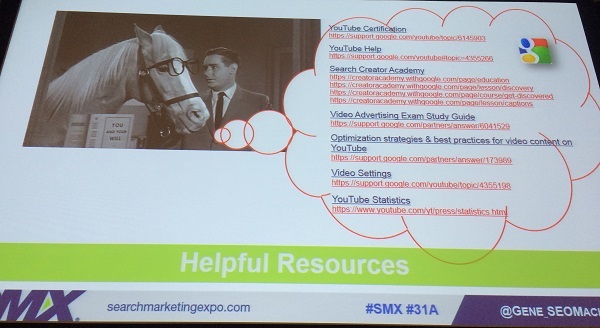 Promote videos through SEM (see this YouTube Help article for more ways to promote your videos: https://support.google.com/youtube/answer/141808). Content quality – That old song again. Create non-boring content up to 203 mintes in length. Understand your customer’s attention span. Slice lengthy videos into multi-part videos. Get to the point quickly. Use :29 and :15 durations for successful video advertising. Playlists – Don’t miss out! If you already have videos, building a playlist is not creating content — you’re making it more engaging and usable. Natural content – Have you read your comments lately? This builds content on the YouTube page. Suggestions for new content come from comments. Advertise – Hello! Can anyone see/hear you? Probably not. Give your videos a paid push. Try YouTube Sponsored Search, pre-roll video ads, in-stream ads videos. Use companion banners. Use video remarketing. Bid on competitor names and videos. Call to Action – Engage videos! Include your phone number or web address. Don’t forget overlays to resources mentioned in videos. Don’t leave out branding!!! Jeff Martin: Millions of Organic Views in 20 Minutes or Less! Touchstorm is a certified YouTube partner, and they know all the guidelines of YouTube. For a video to maximize its visibility, two factors have to be looked at — meta data and video performance. Meta data optimization starts with keyword research. Look at the YouTube Instant suggestions when you start typing in a YouTube search bar. You can see new ideas and roots that you hadn’t thought of based on what people have been searching. Keywordtool.io is a more efficient way to do keyword research. There’s a small fee for using it. 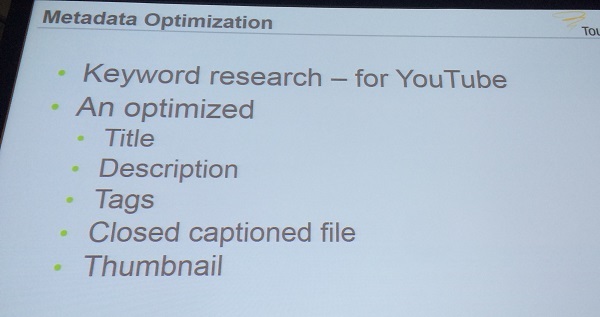 As you refine the keywords, search for those keywords in YouTube. Take a look at the results: Is that what your content would be like, or is it different and unrelated? That’s a good indicator of whether a keyword fits your video. Once you’re confident in your keywords, look those keywords up in Google Trends YouTube to get a priority for creating the videos. Use full keyword phrases to optimize early on for channels without a significant subscriber base. If a video’s performance takes off, there is flexibility to adjust later to try to capture more. Optimize the most popular keywords from left to right. Example of possible titles for the same video. Start with the first one and if the video does well, you can advance to options 2 and 3. 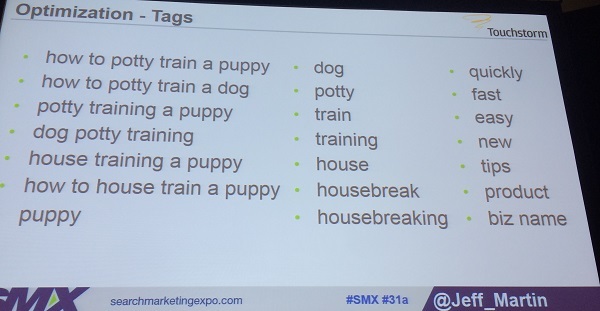 Don’t stuff keywords (i.e., overuse them). Videos removed seldom, if ever, come back. You’ll have to start over again. 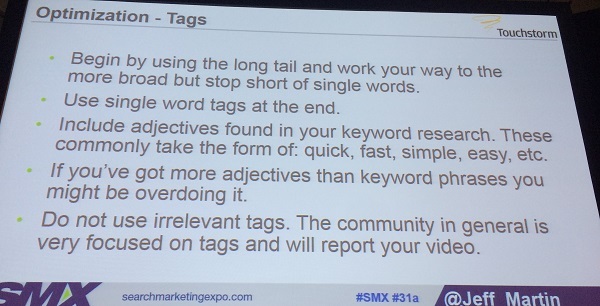 YouTube says to begin tags with long-tail phrases and work down to single-word phrases including the brand. You can include adjectives like “quick,” “simple” and “easy,” but it should be a red flag to you if there are more adjectives as tags for your video than other types. Traditional SEO has two sides: on-page and off-page. 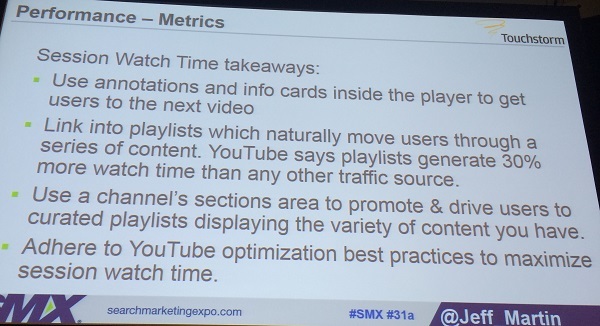 YouTube’s two sides of SEO are on-page and performance. Views are valuable, but not for the number they add up to. Engagement always lags behind views, so when a user pauses and takes an action, it’s valuable. Video watch time is paramount. It’s the total minutes spent watching a video! 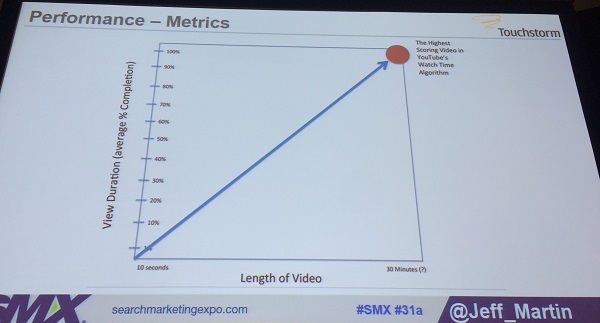 It’s not a measure of how much a video was watched, and it’s not a reason why videos need to be shorter. Session watch time is the total minutes a user watches your content AND any other content during a session. You want your content to be part of a very long session. Currently, there’s no effective way to monitor this as it can span into third-party videos. When completion rates are equal, a shorter video needs more views than a longer video to compete. The longer a video is, the more challenging it is to retain the audience. Review rankings of competing videos in SERPs to understand the length of videos in use and their success. What software is good for studying your videos’ performance? VideoAmigo.com is a video marketing suite that provides competitive intelligence, an automated YouTube search ranking monitor, in-depth channel analysis and recommendations. He says it’s free! That’s a lot of videos, views and engagement (likes, dislikes and comments)! 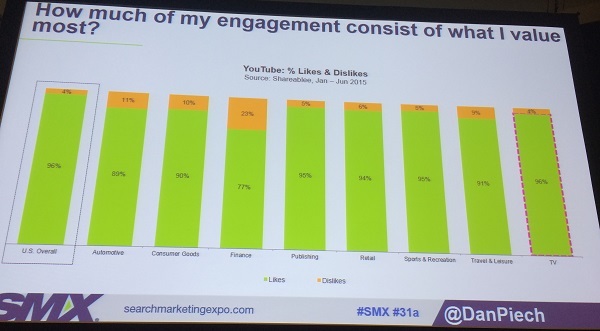 People engage on a per view or per post measure much higher on YouTube than they do on Facebook or Twitter. 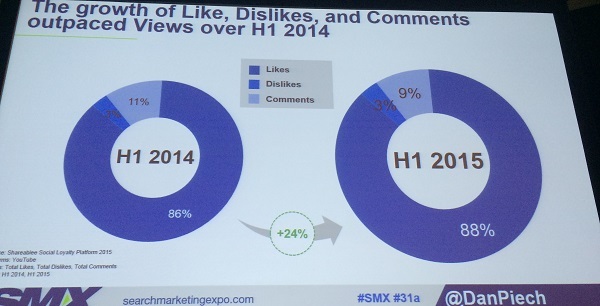 Overall, brand view counts increased only 1 percent last year. However, likes increased by 26 percent, dislikes increased 29 percent, and comments increased 6 percent. Average views per video have declined because the number of videos is growing. 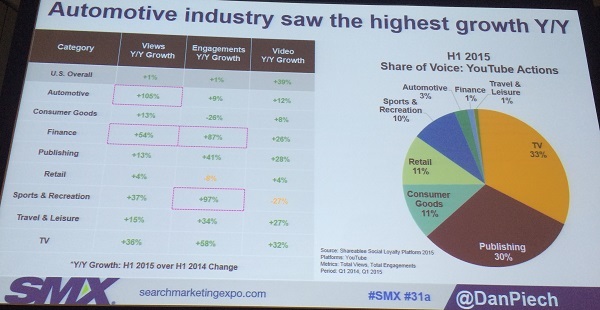 The automotive industry has seen more YouTube views and engagement growth in the past year than other industries. Sports and recreation videos are doing incredibly well in the last year. Their view counts grew 37 percent, but engagements nearly doubled! And yet, the number of videos posted is smaller than the year previous. 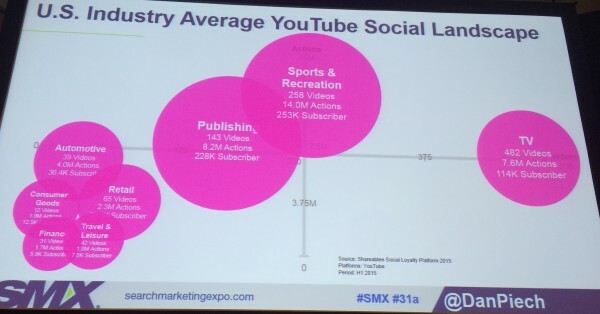 Look at these numbers (shown in the slide above) as they relate to your industry. How frequently should you be posting? It depends on your industry. And quantity is not more important than quality. Looking at a specific industry: fashion, you can see that there’s a big difference in the amount of actions these publishers are getting, despite posting approximately the same number of videos. Vogue is huge on YouTube compared to the other fashion magazines. Look at the Vogue in your own industry to see what you can do similarly. Case study: Video less than 3 minutes drove 60 percent of actions for publishers. TV saw 40 percent of actions from a video between 2 and 4 minutes long. 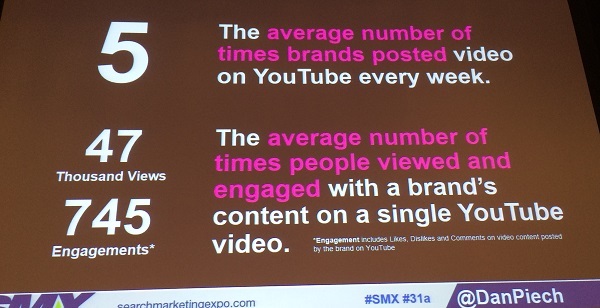 For the average brand, videos 1–4 minutes long drive 50 percent of likes. Those under 3 minutes in length drive more views. Shorter videos get more views, but positive engagements happen on videos that are a little longer. Publishers capture higher likes per view, showing opportunities for co-branded ad sponsored content.